What does a Rush Bowls Franchise Cost? With a Rush Bowls franchise you have the opportunity to create a business that surprises, delights and helps keep your community healthy. The best part? You’ll be joining a TRILLION dollar industry that is growing like no other. Rush Bowls is not only personally fulfilling, but also highly rewarding financially. Find out more about the costs and benefits of this unique, exciting business today! 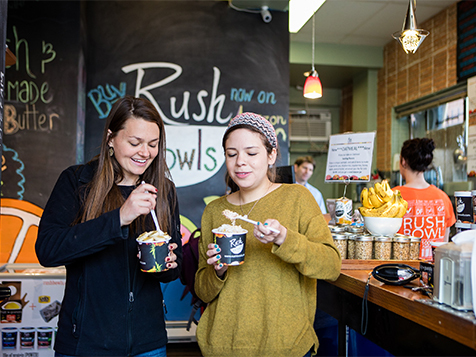 Over the past decade, Rush Bowls has cultivated a loyal following and developed a successful business model by perfecting menu items, processes, vendor relationships and marketing practices. Rush Bowls has been reinventing the fast casual dining experience by offering nutritious meals that burst with flavor and satisfy with fresh, filling, all-natural ingredients. 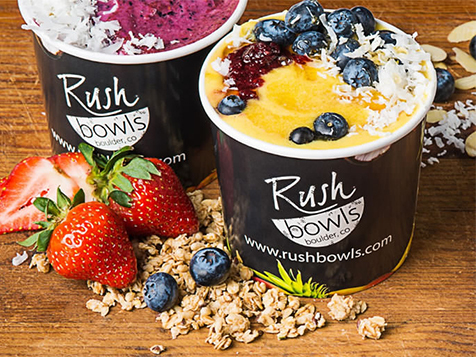 Rush Bowl’s tireless devotion to honest ingredients, crafted in ways that taste sinfully delicious, result in the best fruit and all-natural food bowls available anywhere. Rush Bowls is perfectly situated at the crossroads of two growing industries: the all-natural industry and the fast casual dining industry. We have spent years interacting with and happily serving the elusive younger demographic of 18-28 year-olds that consume more fast casual food than most. Simply put, we get them and they get us. 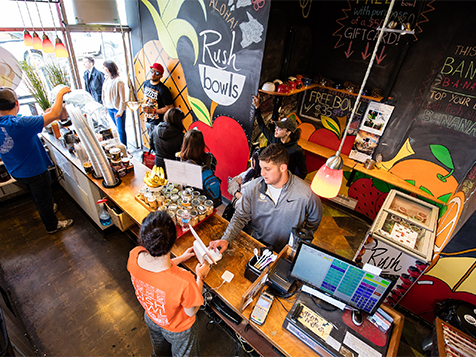 Rush Bowls attracts people who are interested in eating all-natural, healthy food on the go. This is a massive market which continues to grow rapidly with sales of healthy and all-natural food anticipated to reach $1 trillion by 2017. Rush Bowls is looking to partner with someone who has a solid background in restaurant management (or who has an operating partner with similar experience) and is passionate about service, the Rush Bowl concept and healthy, fast dining. Rush Bowls is specifically looking for multi-unit operators and area developers, but understands that the right individual can sometimes start small and have a solid growth plan. Rush Bowls offers very flexible store requirements. This allows operators to make the most of available space. Rush Bowls is the perfect concept for 500-1,200 square feet, dine in or take-out and is is poised to grow everywhere. In smaller footprints, Rush Bowls is a perfect complement to businesses such as gyms, coffee shops and health food stores. Rush Bowls offers a low-cost and streamlined start-up plan; no cooktops or vent hoods are required. Streamlined operations and minimal waste contribute to stronger margins. Established operations, store layouts, marketing materials and vendor relationships accelerate the time your doors can open for business. If you are passionate about health, great food and want to own a business you can feel good about, request more information now to learn more about opening a Rush Bowls in your area.